See also Halifax gibbet, a kind of guillotine. A gibbet /ˈdʒɪbɪt/ is any instrument of public execution (including guillotine, executioner's block, impalement stake, hanging gallows, or related scaffold), but gibbeting refers to the use of a gallows-type structure from which the dead or dying bodies of executed criminals were hanged on public display to deter other existing or potential criminals. In earlier times up to the late 18th century, live gibbeting also took place in which the condemned was placed alive in a metal cage and left to die of thirst. The term gibbet may also be used to refer to the practice of placing a criminal on display within a gibbet. This practice is also called "hanging in chains". Exhibiting a body could backfire against a monarch, especially if the monarch was unpopular. 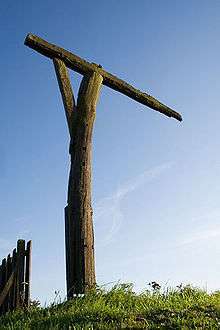 The rebels Henry of Montfort and Henry of Wylynton, enemies of Edward II, were drawn and hanged before being exhibited on a gibbet near Bristol. However, the people made relics of these bloody and mutilated remains out of respect and later used the relics in violent protest. Miracles were even reported at the spot where the bodies were hanging. Although the intention was deterrence, the public response was complex. Samuel Pepys expressed disgust at the practice. There was Christian objection that prosecution of criminals should end with their death. The sight and smell of decaying corpses was offensive and regarded as "pestilential", so it was seen as a threat to public health. Pirates were sometimes executed by hanging on a gibbet erected close to the low-water mark by the sea or a tidal section of a river. Their bodies would be left dangling until they had been submerged by the tide three times. In London, Execution Dock is located on the north bank of the River Thames in Wapping; after tidal immersion, particularly notorious criminals' bodies could be hung in cages a little farther downstream at either Cuckold's Point or Blackwall Point, as a warning to other waterborne criminals of the possible consequences of their actions (such a fate befell Captain William Kidd in May 1701). There were objections that these displays offended foreign visitors and did not uphold the reputation of the law, though the scenes even became gruesome tourist attractions. In cases of drawing and quartering, the body of the criminal was cut into four or five portions, with the several parts often gibbeted in different places. So that the public display might be prolonged, bodies were sometimes coated in tar or bound in chains. Sometimes, body-shaped iron cages were used to contain the decomposing corpses. For example, in March 1743 in the town of Rye, East Sussex, Allen Grebell was murdered by John Breads. Breads was imprisoned in the Ypres Tower and then hanged, after which his body was left to rot for more than 20 years in an iron cage on Gibbet Marsh. 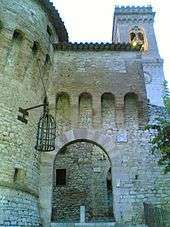 The cage and Breads' skull are still kept in the town hall. Another example of the cage variation is the gibbet iron, on display at the Atwater Kent Museum in Philadelphia, U.S. The cage, created in 1781, was intended to be used to display the body of convicted pirate Thomas Wilkinson, so that sailors on passing ships might be warned of the consequences of piracy. Because Wilkinson's planned execution never took place, the gibbet was never used. An example of an iron cage used to string up bodies on a gibbet can still be seen in the Westgate Museum at Winchester. Public crucifixion with prolonged display of the body after death can be seen as a form of gibbeting. Old Testament (Torah) law forbids gibbeting beyond sundown of the day that the body is hanged on the tree. Gibbeting was one of the methods said by Tacitus and Cassius Dio to have been used by Boudica's army in the massacre of Roman settlers in the destruction of Camulodunum (Colchester), Londinium (London) and Verulamium (St. Albans) in AD 60–61. Hanging of Cromwell, Bradshaw and Ireton. The body of Oliver Cromwell was gibbeted after his death, after monarchists disinterred it during the restoration of the monarchy. Robert Aske, who led the rebellion against Henry VIII known as Pilgrimage of Grace, was hanged in chains in 1537. Bird Island and Nix's Mate island in Boston Harbor were used for gibbeting pirates and sailors executed for crimes in Massachusetts during the colonial era. Their bodies were left hanging as a warning to sailors coming into the harbor and approaching Boston. About 1755 a slave "Mark" was hanged and gibbeted in Charlestown, Massachusetts; twenty years later Paul Revere passed the remains of "Mark" on his famous ride. Marie-Josephte Corriveau (1733–1763), better known as "La Corriveau", is one of the most popular figures in Québécois folklore. She lived in New France, was sentenced to death by a British court martial for the murder of her second husband, and was hanged for it, and her body was hung in chains. Her story has become legendary in Quebec, and she is the subject of numerous books and plays. In 838, Babak Khorramdin had his hands and feet cut off and was then gibbeted alive while sewn into a cow's skin with the horns at ear level to crush his head gradually as the skin dried out. The leaders of the Anabaptist movement in Münster were executed in 1536, and their dead bodies were gibbeted in iron cages hanging from the steeple of St. Lambert's Church. The cages are still on display there today. Following his execution by hanging in 1738, the corpse of Jewish financier Joseph Süß Oppenheimer was gibbeted in a human-sized bird cage that hung outside of Stuttgart on the so-called Pragsattel (the public execution place at the time) for six years, until the inauguration of Karl Eugen, Duke of Württemberg, who permitted the hasty burial of his corpse at an unknown location. Being a seafaring nation in the 17th and 18th centuries, Bermuda inherited many of the same customs as England, including the gibbet. Located in Smith's Parish at the entrance to Flatt's Inlet is Gibbet Island, which was used to hang the bodies of escaped slaves as a deterrent to others. The small island was used for this purpose because it was not on the mainland and therefore satisfied the superstitious beliefs of locals who did not want gibbets near their homes. The January 1921 issue of National Geographic Magazine contains a photograph of a gibbet cage in use in Afghanistan. Commentary included with the photograph indicates that the gibbet was a practice still in active use. Persons sentenced to death were placed alive in the cage and remained there until some undefined time weeks or months after their death. In 1837, five years after the practice had ceased in England, the body of John McKay was gibbeted near the spot where he had murdered Joseph Wilson near Perth, Tasmania. There was great outcry, but the body was not removed until an acquaintance of Wilson passed the spot and, horrified by the spectacle of McKay's rotting corpse, pleaded with the authorities to remove it. The place where this occurred was just to the right (when travelling towards Launceston, not to be confused with the private road with the same name) on the Midlands Highway on the northern side of Perth. It is the last case of gibbetting in a British colony. The Murder Act 1751 stipulated that "in no case whatsoever shall the body of any murderer be suffered to be buried"; the cadaver was either to be publicly dissected or left "hanging in chains". The body was encased in flat bars of iron of two and a half inches in breadth, the feet were placed in stirrups, from which a bar of iron went up each side of the head, and ended in a ring by which he was suspended; a bar from the collar went down the breast, and another down the back, there were also bars in the inside of the legs which communicated with the above; and crossbars at the ankles, the knees, the thighs, the bowels the breast and the shoulders; the hands were hung by the side and covered with pitch, the face was pitched and covered with a piece of white cloth. The gibbet was a foot in diameter with strong bars of iron up each side. The post was fixed into a one-and-a-half-ton stone base sunk into the Slake. The body was soon removed by fellow miners and given a decent burial. The head was shaved and tarred, to preserve it from the action of the weather; and the cap in which he had suffered was drawn over his face. On Saturday afternoon his body, attired as at the time of his execution, having been firmly fixed in the irons necessary to keep the limbs together, was carried to the place of its intended suspension. Thousands of persons were attracted to the spot, to view this novel but most barbarous exhibition; and considerable annoyance was felt by persons resident in the neighbourhood of the dreadful scene. Representations were in consequence made to the authorities, and on the following Tuesday morning instructions were received from the Home Office directing the removal of the gibbet. In Scotland, the final case of gibbeting was that of Alexander Gillan in 1810; thus the punishment had disappeared in practice over two decades before it was formally repealed by statute. In 1834, Britain outlawed gibbeting. However, in the British Raj of India in 1843, Charles James Napier threatened to have such structures built in parallel to any attempt to practice Sati, the ritualized burning of widows, to execute the perpetrators. ↑ Oxford English Dictionary, 3rd Ed., Oxford University. Electronic CD edition. ↑ Gallagher, Rob. "Gibbeting". Archived from the original on 22 November 2008. Retrieved 2 January 2009. ↑ Jusserland, J. J. (1891). English Wayfaring Life in the Middle Ages. London: T. Fisher Unwin. pp. 342–343. ↑ Sellin, T. (1955). The Philadelphia Gibbet Iron. Journal of Criminal Law and Criminology, 46(11), 11–25. ↑ DeLombard, Jeannine Marie (2012). In the Shadow of the Gallows: Race, Crime, and American Civic Identity. University of Pennsylvania Press. p. 81. ISBN 978-0812206333. ↑ Gatrell, V A C (1994). The Hanging Tree: Execution and the English People, 1770-1868. Oxford: OUP. pp. 268–269. ISBN 0-19-285332-5. ↑ "Durham prison". Capitalpunishmentuk.org. Retrieved 2013-04-12. Gatrell, V. A. C. (1996). The hanging tree: execution and the English people, 1770–1868. Oxford: Oxford University Press. pp. 266–269. ISBN 0-19-820413-2.